Plymouth City Centre is slowly being transformed with many new buildings springing up all around the edges, even if the centre itself is still looking a bit tired. Evidence of transformation is found in the picture above with the cranes to the right working on the new University buildings - more photos of these to follow! The Park and Ride has also been transformed with the new Enviros. Its not all new though. 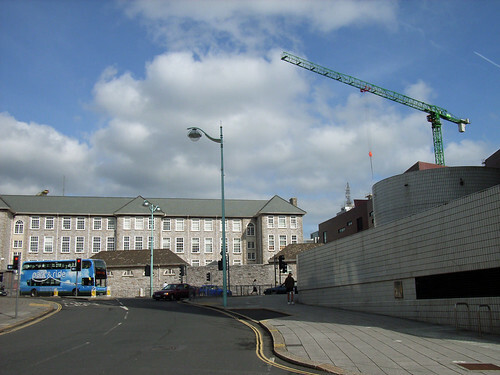 The large grey prsion like building in the background was the old Public High School, now part of the University. Not quite sure how this has managed to survive in this area - Many would like to see it stay I am sure, but personally I went to school there and hated it - so would be happy to see it go!